Feet hurt, tingling sensation from ankle to toes. Also arms from joints to fingers are tingling, nerve damage? Idk if he managed to get in last night. The ribbon on my door was caught between door and jam this am when I exited, idk if I did that accidentally or what. 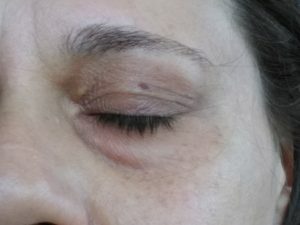 Eyes are also painful and red around the dark areas. Idk if it’s lack of sleep or what. I’m feeling a little weird this am. Kind of a drugged feeling, idk. Maybe it’s from thinking he may have got in? If so how did he get past my friend? Am I placing too much emphasis on these details, is it natural occurance from the last attack, or God forbid, new……who could blame me for wondering. His being so close by and having been through every inch of my home almost daily for years, and now recalling how quick he can be, well I may just be driving myself nuts. Idk. Lord have mercy and be quick to help me. Midsection also painful all around from back to front in a circle. I have been dealing with this for about a week or so, maybe longer. I’m also feeling nauseated now. I did have fried food last night, hoping that’s the source of my trouble. But in case I’m journaling it. 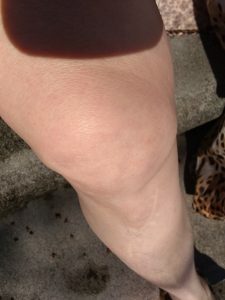 Guess it’s difficult to see the red spots on my knees but on rt knee there are dark spots beneath the red I saw. Dr. Muhammud at Penn. Medical had noted a tool had been used to remove my kneecap and fluid beneath. The fluid is around the knee. He showed me the dots on my knee that are from the tool, I can make them out. He found this in 2013. At least some empirical evidence is available. 11.53 smelling garlic oil, location unknown atm. 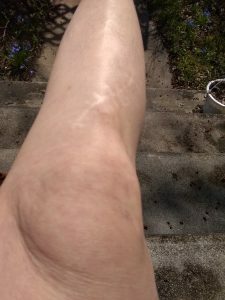 Friend dropped by, can’t remember his name has beard like col. Sanders of k of c, he saw the yellow around my eyes and red on my left knee. 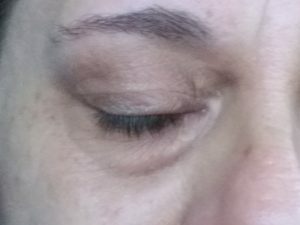 My head and face feel like they are falling asleep, nerve damage? WTH is happening to me. It feels like legs would feel if in same position for too long. Eyes aching more. 11.58. woke at 7. On the porch in natural light. The yellow is still there, and eyes are reddish. Again idk if it’s natural red or not. I guess one eye shot should suffice. 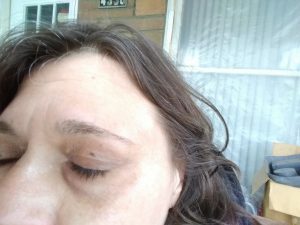 Right eye is similar. Had to enlarge photo. 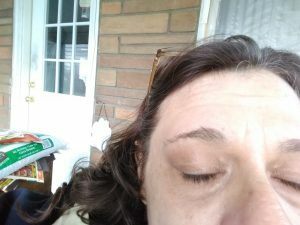 Right eye. Thought since sometimes finger marks appear beneath eyes I should get photos of both. Right eye enlarged to show detail. I can see some darkness across the bridge of my nose too, where it has been painful. What he’s doing and how is a mystery to me. It’s very frightening! 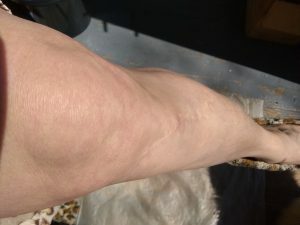 Left knee full sun. Idk if the red can be seen on my knee it was prominent when a friend stopped by and I showed him my knee. Right knee full sun hard to see what turned out. Right knee extended. There’s a lot of red spots on both knees. Red mark on left breast, I wore soft loose comfort bra to bed. Lord have mercy! The area is a little raised. U may notice some grey in-between them too, healing bruise that I’ve had for long time. However there is some red in-between them. Also a little red on my neck. Right Breast not as red but some can be seen. Hoping for another explanation. I can’t fathom he was able to get in!! Left breast again, tried to show more of the red mark. I just don’t know a natural explanation. Hoping there is one!